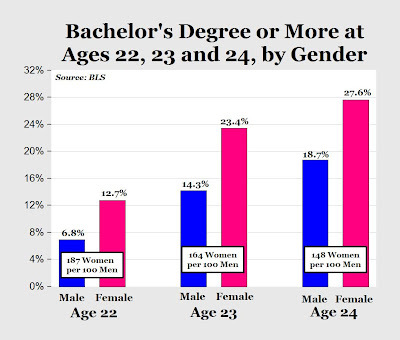 According to the 2011 Projections of Education Statistics from the U.S. Department of Education, the total number of Ph.D. degrees granted to women first exceeded those granted to men sometime in 2007-2008. Over the next decade, the number of wo­men Ph.D. recipients is expected to grow 1.75 times faster than the number of men reci­pi­ents until, in 2020, the overall ratio will be roughly 5 to 4. So, is this good? If not, what is to be done?